Olasky's Fighting for Liberty and Virtue seems a bit like Fernandez-Morera's Myth of the Andalusian Paradise, an regrettably polemical look at an inherently interesting subject. "[Chairman Mao] went on to a comparison between his China as seen from [the Communist rebel base at] Yenan and the American Revolution as a foreign reporter might have seen George Washington at Valley Forge. ...Did George Washington have machinery? he asked. Did George Washington have electricity? No. 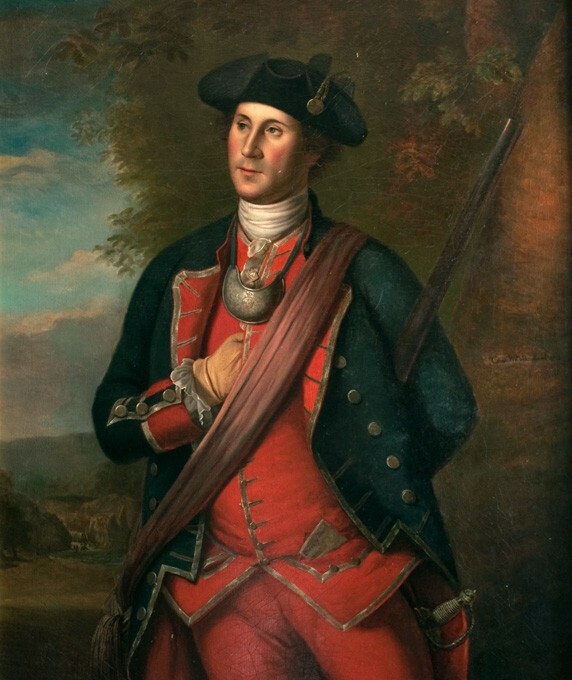 The British had all those things and Washington did not, but Washington won because he had the people with him." ---From "In Search of History," by Theodore White, page 260. While Chairman Mao was perhaps a little confused about the sequence of technological progress in the West, few people would quarrel with his general point that the American Revolution succeeded because of widespread popular support, despite the general material inferiority of the rebels to their British opponents. In this book, Dr. Olasky seems to be similarly confused about the strength of the parallels between the political climate of the Revolutionary era and that of our own time, though many of his points about the importance of non-conformist Protestantism in the politics of eighteenth century America are well taken. America is, in some sense, the same country that it was two centuries ago, so some hardy perennials of American history, such as tax protests and calls for local control, were discernible even in late colonial times. The fact is, however, that the late eighteenth century was not, as he would have us believe, a time of culture war between virtuous American Republicans and decadent British monarchists. One could argue, in fact, that he slights his own partisan interest by claiming that Presbyterians and Baptists played as strong a role in the Revolution as the Christian Right is playing today. Contemporary political Christianity is not as important as it was in the 1770s: it is much more important. Marvin Olasky is a journalism professor at the University of Texas at Austin, editor of the Christian Weekly news magazine "World," and, among other things, a general editor of the Turning Point Christian Worldview Series, published by Crossway Books and the Fieldstead Institute. One of his recent books, "The Tragedy of American Compassion," is a historical critique of welfare policy that received the special approbation of Speaker Gingrich. 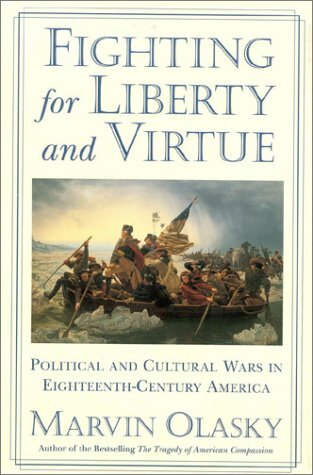 "Fighting for Liberty and Virtue" similarly uses history to advance a contemporary agenda. His thesis is that the American Revolution was made possible by a coalition of those interested in small government (particularly as manifested by low taxes) and those interested in holy government. The book will, no doubt, provide rhetorical ammunition with which cultural conservatives can defend themselves against the charge of injecting theological values into today's politics that would have been alien to America's founders. (There is even an Appendix with the helpful title, "Sound Bites from the 1780s for the 1990s.") The difference between polemic and scholarship is that the latter is careful to provide contrary evidence, and to state opposing views fairly. "Fighting for Liberty and Virtue" is clearly an example of the former. The people of the Revolutionary era, we are told, favored every possible device to keep government "close to the people." For instance, as Olasky notes, colonial legislators generally served without pay, except for expenses. He contrasts this with representation in the British parliament, which he characterizes as "potentially enriching." Actually, there was nothing "potential" about the financial benefits that flowed to loyal faction members in the legislatures on both sides of the Atlantic in those years. However, he might also have mentioned that service in parliament during the eighteenth century was also without pay, except for members of the cabinet, and that it continued to be an unpaid honor until 1911. The Liberal Party government then provided a small salary, so that people who were not independently wealthy or in the employ of some interest could afford to serve. The Founding Fathers made this reform in the Constitution we have today, but then Olasky suggests, as we will see, that the Constitution was a ghastly mistake. The book's most peculiar thesis is that the moral depravity of the ruling class of Georgian England doomed the Empire in the Revolutionary War. That eighteenth century British aristocrats were often very naughty is not in dispute. The point is easy to prove from the contemporary literature: we are talking about a time and place that produced Swift and Sam Johnson and Hogarth. And of course, the stories themselves are entertaining. Thus, we are regaled with tales of how Lord Cornbury, appointed to be royal governor of New York in the early 1700s because he was a cousin of Queen Anne, used to flounce about the ramparts of Manhattan in a woman's dress. We hear about the eighteenth century "Hell Fire" clubs (there was apparently more than one), and the odd parties that the Earl of Sandwich, who as First Lord of the Admiralty was perhaps most responsible for the neglect of the fleet that permitted the French to provide vital aid to the American insurgents, used to host at his renovated Cistercian abbey. (The incidents involving the baboon were particularly deplorable.) George Sackville, Secretary of State for North America during the Revolution and primarily responsible for grand strategy, seems to have been uncommonly fond of certain young officers, thus suggesting that even then "gays in the military" were a morale problem. In sum, we are reminded that eighteenth century British government was rife with bribery, that business enterprises were frequently scams (as the South Sea Bubble illustrates), and that military officers embezzled and mismanaged supplies. Olasky does not claim that the American leaders were without stain. Only Samuel Adams and Patrick Henry get his unmitigated approval, whereas Benjamin Franklin, the old goat, comes in for special denunciation. (Indeed, we are told that Franklin only "changed sides" to support the colonies a year before the Revolution began.) Curiously absent from this rather Confucian tally of virtue and vice in office is the figure of George III. By all accounts, he was hardworking and well-meaning. He was so faithful to his Queen Charlotte (they had 15 children) that his less monogamous courtiers thought it odd. After the American Revolution he suffered from bouts of insanity, which doctors now believe to have been caused solely by body chemistry. (During his incapacitation, his relative virtues were made all the more evident by the appalling behavior of his son, the Prince Regent.) The story of George III bears less resemblance to that of Belshazzar than to that of Nebuchadnezzar, or even of Job. It is simply false to say that the Revolution constituted a "culture war" between England and the United States. The leaders of both sides were a mixture of deists, agnostics, libertines and Christians of ordinary piety. The populations they led were not so different from their leaders. The British government, unlike the liberal establishment of today, had no new morality of their own devising which they hoped to impose on the colonies. The British leadership seems not to have had any ideological policy at all, beyond the maintenance of parliamentary supremacy throughout the Empire. The "culture war" of the Enlightenment started when the Revolution in France sought the end of class distinctions, traditional morality, and the expurgation of Christianity. In that war, Britain and the young United States were pretty much on the same side. (The United States also had its Jacobin "Left," of course, which agitated for direct support of revolutionary France.) Though the culture war that began with the French Revolution has suffered various mutations, that is the conflict which continues to this day. Eighteenth century Americans were certainly amenable to the idea that the British Empire was a hopelessly corrupt institution on its way to a resounding collapse. When Edward Gibbon's "The Decline and Fall of the Roman Empire" began to appear in 1776 (the whole work was published over a period of about ten years), it soon became part of the favorite reading of America's leaders. It was cited as a mirror of the contemporary condition of Great Britain, and, at the Constitutional Convention, as a prophecy of what could happen to the United States if the participants did not do a good job. While its application as prophecy remains to be seen, as a diagnosis of Britain it was clearly wide of the mark. The British polity in the second half of the eighteenth century was a society striving to get a grip on itself. This, really, was what started the American Revolution. Parliament was trying to introduce some rudimentary fiscal and regulatory order into its haphazard Empire. The problem in America was that these reforms ran afoul of well-established traditions of self-government, with what results we know. However, in the decades immediately following the loss of the American colonies, decadent Britain went on to defeat Napoleon, reform its domestic life in the reign of a queen whose name became a byword for pious rectitude, and create the largest empire in the history of the world. Eighteenth century Britain was a disordered society. However, its disorder did not spring from moral exhaustion. Olasky's chief focus in the book is the role of religion in eighteenth century politics, and the material he presents is worth reading. He quotes at length from the tracts and sermons of the time, sources which probably reflect the feelings and ideas of ordinary people, even of ordinary educated people, far better than do the writings of people like Franklin or Tom Paine. He is quite correct in noting that the role of religion in American history has often been shortchanged by historians. As G. K. Chesterton remarked, America is a nation with the soul of a church. This is why American history is more than usually baffling. It is almost certainly true that the Great Awakening, that strange movement of the national spirit that erupted in the 1730s and 40s, was a necessary predicate to the Revolution forty years later. Olasky quotes a Hessian officer as saying that the Revolution was essentially a revolt of Scotch-Irish Presbyterians, and certainly religious non-conformists looked on the Revolution as a way to free themselves from the government that had persecuted them or their ancestors. To the English after their victory in the Seven Years War (the French and Indian War in America), it seemed perfectly reasonable to consider establishing an Anglican bishop in America; after all, Anglicanism was the established church in several of the colonies. To American Presbyterians and Baptists, however, the very idea smacked of the crypto-papist tyranny of the Stuart dynasty. The Stuarts had been deposed in the Glorious Revolution of 1688, an event that gets curiously scant attention from Olasky, though it was certainly much on the minds of people in the English-speaking world in the century that followed. To the Awakened, as Olasky calls those touched by the Great Awakening, that prior Revolution was a milestone in the history of Christianity. Because of it, the personal conscience of Englishmen was freed from the dictates of an established creed. To the Enlightened, which included such people as Franklin and Adams and Hamilton, it was the foundation of consensual, rational, limited government. To both groups, it provided a model for insurrection that could be put into action, if some issue arose that engaged both strands of American culture. Olasky notes some pre-Revolutionary controversies that seemed to do this. Notable among them was the "Parsons' Cause." In that case, Patrick Henry defended against a suit by clergy of the established Anglican Church in Virginia in which they sought to be paid in money rather than tobacco. (He won in that the jury awarded the parsons only a penny in damages.) This was one of those incidents, according to Olasky, that made it possible for the Awakened with their concern for holy government to join forces with the Enlightened, whose idea of good government included the need for low taxes. Persons wishing to draw comparisons with the present state of the Republican Party are invited to do so. The problem is that, if you draw such a comparison, the apparent power of eighteenth century piety will suffer from it. The concerns about church establishment and holy government which Olasky (and others) have documented are absent from the Declaration of Independence. God is much mentioned in that document, of course, but nowhere does it suggest that He is much exercised by the prospect of an American bishop or by the cross-dressing ways of certain royal governors. Even though the recent British reorganization of neighboring Quebec is alluded to, the document does not complain about the re-establishment of Roman Catholicism as the official church there, a step that is well-known to have excited outrage from American Protestants. Olasky explains these omissions by noting that the Declaration was a compromise between the Enlightened and the Awakened. Besides, its primary drafter was that notorious free-thinker, Thomas Jefferson. Still, in a compromise you are supposed to get at least part of what you want. If we judge by the output of the Continental Congress, however, it would appear that Olasky's Awakened were not so much accommodated as co-opted. This brings us to the question of the merit, and even the legitimacy, of the current United States Constitution. There is a long tradition in American historiography, most famously propounded by the Marxist historian Charles Beard, which holds that the Revolution itself was a popular rebellion, but the Constitutional Convention of 1787 was a sort of counter- revolution, an anti-democratic cabal of Masons and proto-capitalists intent on wresting power from the populist state governments. Olasky is of similar mind, with the addition that the Convention retreated not just from the principles of small government, but from the desire for holy government. A powerful central government, it seems, is an occasion of sin. This assessment of the origins of the Constitution is counterfactual. If anything, it was the Continental Congress that smacked of conspiracy. It was composed, after all, of the representatives of provisional revolutionary governments, themselves with shaky legality and questionable popular support, who met to declare themselves the effective government of the continent. The Declaration it issued looked for its ultimate ratification not in ratifying assemblies, but on the battlefield. The Constitutional Convention of 1787, in contrast, was composed of the representatives of legal states. They assembled simply to draft a document, a constitution they claimed no power or right to impose themselves. In further contrast to the Congress of 1776, the Convention discussed in detail all those issues of religious establishment and freedom of conscience which so deeply troubled pious Americans of the time. Unlike the Declaration of Independence, the Constitution does not mention God. On the other hand, it actually does make some provision for liberty of conscience by forbidding the imposition of a religious test for public office. (It also allows for "affirmations" rather "oaths," in deference to Quaker sensibility.) The Bill of Rights, soon to be promulgated by the First Congress, would provide more protections. It is doubtless true, as Olasky suggests, that the Supreme Court today has radically misinterpreted the First Amendment as a protection from religion, rather than as a prohibition of a state church. However, the flaw there is not the Constitution, but the prejudices of the modern judiciary. What makes Olasky's argument somewhat grotesque is the assumption that small government and holy government normally go together. If by "small government" you mean low tax, low service states with lengthy constitutions that make it almost impossible for the state to do anything at all, then there has been no lack of such regimes throughout American history, particularly in the Deep South. They have been notable chiefly for the corruption of their public officials and the poverty of their people. They have also been fantastically anti-democratic. Their relative isolation from federal oversight until the desegregation era permitted many a governor or party leader to entrench his squalid little tyranny with small danger of ever having to face a fair election. Much the same thing happened in the cities of the Northeast in the late nineteenth and early twentieth centuries. Taxes were higher, perhaps, but the urban Democratic political machines were as "close to the people" as any post-Revolutionary anti-federalist might have wished. Probably rather more so. The Founding Fathers, who for all their faults set a standard of intelligent civic virtue unique in human history, discussed the merits of large and small government at length in the Constitutional Convention. They concluded, correctly, that small states were at least as prone to tyranny and corruption as large ones. They also saw that the attempt to turn the question of the powers of the federal government (indeed, the question of whether there should be a United States at all) into a choice of "big government, small government" was a red-herring. The real danger was anarchy and civil war, with tyranny to follow. This is one parallel with the past that today's cultural conservatives would do well to remember.